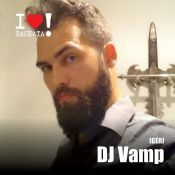 DJ Vamp discovered his extraordinary passion for music at the age of 7 with his first piano lessons. Over the next 20 years he acquired outstanding knowledge and understanding of music by learning piano, drums, guitar as well as salsa and bachata dancing. Not satisfied just by reproducing music, he deepened his understanding of audio technique and composition at the State University of Music in Stuttgart. In November 2013, he visited the spanish championship of bachata in Cadiz where he realised that bachata is the sole dance where you can play beautiful music with a beautiful living instrument on the dance floor. Since then, he has regularly taken part of various bachata festivals across europe and is a big supporter of all bachata styles in germany by teaching, DJing in West Germany and East Belgium. Not knowing this, you most probably dont recognize him or even dislike him, but as soon as you do, you will sincerely not forget.